There’s quite a buzz at the Surry Hills outpost of this guilt-free grocery store and café, which stocks all the usual natural products from washing powder to vitamins. They've also got an extensive range of food, both on the shelves and ready-made. There’s a bar for nuts, a bar for salads, a bar for hot food, one for dessert, another for yoghurt and fruit and even one for pizza. Just walk in, fill a box with whatever you feel like eating and walk out with your head held high – and a sense of smugness that will follow you for the rest of the day. 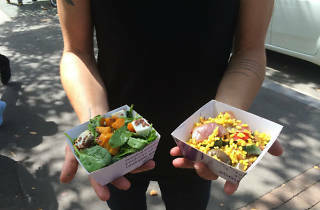 On the first working day of Meat Free Week, a group of Time Out Sydney editors popped in with one goal: find the most obnoxiously healthy lunch you can, and report back. One of us may have cheated, but hey, the mince was excellent! In any case, here's a rundown of what we ate. Feeling indecisive? 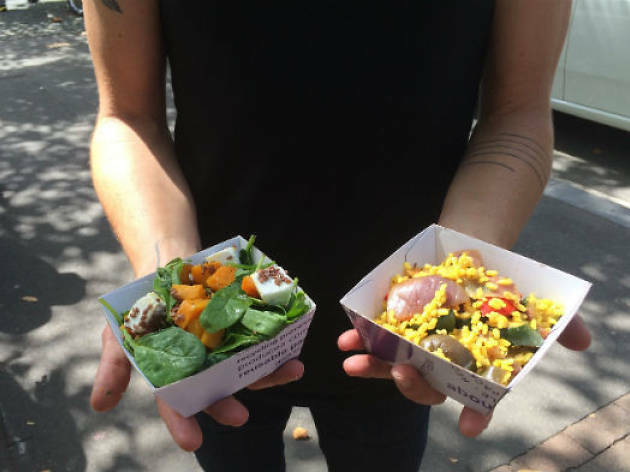 Then About Life is either a dream come true or your worst nightmare – the place is heaving with healthy eating options, presented fresh at the salad bars or pre-packaged in the refrigerated section. Mix and match from both, we say. For hot food, the vegetable stir fry offers a crunchy mix of broccoli, cauliflower and leafy greens. Be sure to season it with some salt and pepper, though – on our visit, it verged on bland. More enticing: a side of turmeric-spiced cauliflower dotted with tamari almonds. On our visit, pre-made mixes were on offer at two for $9, so we grabbed a rice salad dotted with zucchini, onion, capsicum, sultanas, fresh coriander and Moroccan spice, gently mixed with a splash of orange juice for a citrus kick. It paired beautifully with an omega boost salad that was as delicious as it was simple: pumpkin, feta cheese and linseeds atop a bed of baby spinach leaves. Drizzle a bit of the balsamic vinaigrette, provided with your purchase, on top to up the flavour here, too. If you need a lunch that will fill you up more substantially than your usual tuna on a bed of salad, try the eggplant bake with a bunch of salads on the side. The bake is like a lasagne – just made with eggplant instead of pasta sheets – with heaps of well-seasoned tomato sauce, ricotta and cream cheese layers. This wholesome creation, which is basically scrambled eggs tossed with quinoa and tomatoes, is surprisingly delicious; the kind of dish that will warm you on a cold day, and fill you up when you're hungover. So how, exactly, does raw lasagne work? Pretty simple: folds of shaved zucchini, raw tomato paste, basil pesto and cashew nut cheese replace the usual carb, meat and cheese layers. The zesty tomato is a little bit like a salsa and the oily pesto packs in lots of good fats, while the slightly chunky faux-cheese binds it all together. Even the most carnivorous eater at Time Out HQ was impressed by the heartiness of this clean-eating lasagne impersonator. While everyone else is packing boxes with raw salads and chia puddings, you can be that guy: take a pizza base and construct a mighty vegetarian feast to your exact specifications, all for under a tenner. There’s cherry tomatoes, zucchini slices, chickpeas, corn, tomato relish, mushrooms, onion, and broccoli as topping options – plus tuna if you’re a pizza renegade – along with olives, capers, artichokes and sun-dried tomatoes for heightened flavour. Throw some fetta or a sprinkling of mozzarella on top, then take it to the cheese counter and have 'em cook it for you. It may not be a particularly authentic pizza – or even the healthiest thing on offer. But it is packed with vegetables, so... we’re claiming it still counts. Mum might’ve been on to something when she was disguising all those healthy veggies in our spag bol. It's the same story at About Life, where a heaping serve of (admittedly un-vegetarian) lasagne sneakily hides all those healthy bits like lentils, chia seeds and mushrooms. Now, it’s anyone’s guess whether stacking our environmentally friendly cardboard bowl with an oversized serving of mince, red wine, cream and molten cheese accompanied by a generous handful of flaxseed corn chips is really doing us any nutritional favours. But when it's surrounded by all kinds of wholesome-sounding salads and the chips are topped with About Life's simple (and healthy!) signature kale and carrot salad with tahini sauce, we're pretty sure it all balances out. Everything in moderation, right? About Life also has stores in Bondi Junction, Cammeray, Double Bay and Rozelle.